Until the following stores A.) Divest from insourced prison labor and B.) 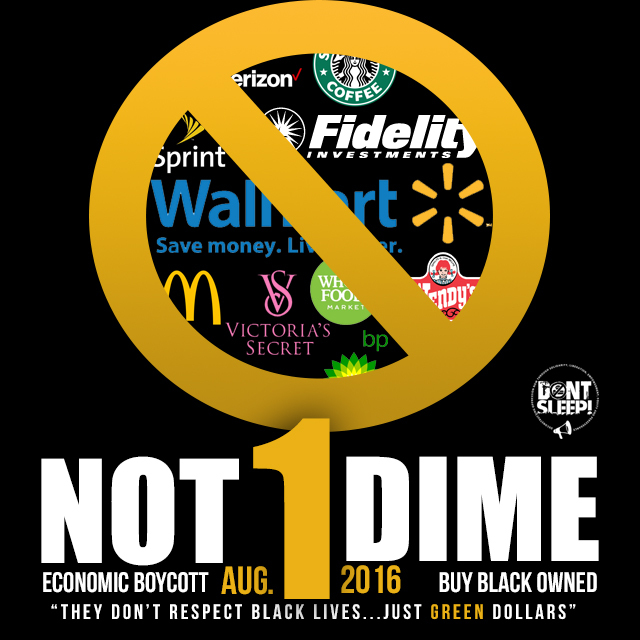 Affirm that ‪#‎BlackLivesMatter‬, we are boycotting all the following establishments. We will not spend ONE SINGLE DIME in stores or with corporations that complicity benefit from the weapon of anti-blackness that is mass incarceration. If you MUST BUY from a store that is not black owned. AVOID THESE RETAILERS. Many, like Walmart and Fidelity Investments are or have been in bed with ALEC (American Legislative Exchange Council), the organization responsible for the Stand Your Ground law famously used to justify the murder of Trayvon Martin. Also pioneering the such things as mandatory minimums, making retail theft a felony (regardless of monetary value), three strikes policies, and more. We will not lend our collective buying power to corporations that reap the benefit of cheap prison labor, in overcrowded prisons filled with mostly black and brown faces. Prisons filled with black men and women locked away for non-violent offenses that due to racial disparities in the criminal justice system; their white counterparts rarely see for similar actions. I refuse to be a willing participant in the system of anti-blackness and oppression. My dollars will be spent in Black Owned establishments whenever feasible; and if necessary elsewhere; but not in or with one single place on this list. You can also monitor the products you purchase and avoid manufacturers who likewise use prison labor. Download the “buycott” app in Apple Store, Google Play or wherever apps are downloaded. Its free and you can choose the campaign to support. I’ve chosen black businesses and anti-prison labor. I urge you to do the same. Any further questions, don’t hesitate to ask. But spend wisely and speak with your wallet. They may disregard our black lives, but we can keep our green dollars and put them to use where they’re needed most. In our OWN communities. African Americans spend a combined one trillion dollars annually. Through our collective buying power, together, we can inflict enough economic upheaval to force a national conversation based solely upon the collective buying power of black people. Going forward we are also encouraging everyone to buy black as much as humanly possible. For a list of blck owned businesses in Indianapolis please visit http://inblackpages.org and come support the Black Owned Business Block Party on August 7, 2016 at Flanner House. This is all part of the movement. We will be free.